..when I’ve finished writing lists that is. I can’t wait! 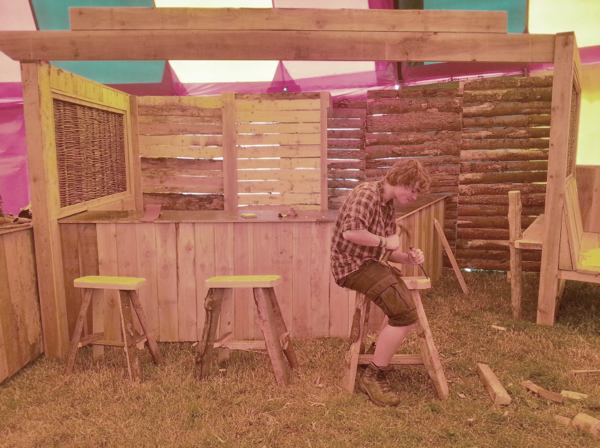 Danny has been there for a week already; helping to build the many bars that will serve pints and pints of beer to the 170,000 people who are limbering up to descend on this corner of Somerset over the next few days. It is an extraordinary event – a veritable town constructed in the middle of otherwise peaceful farmers fields, all for one long weekend of revelry and mayhem. It takes a good half hour to walk from one side of the site to the other and that’s now, before the crowds arrive to slow you down. 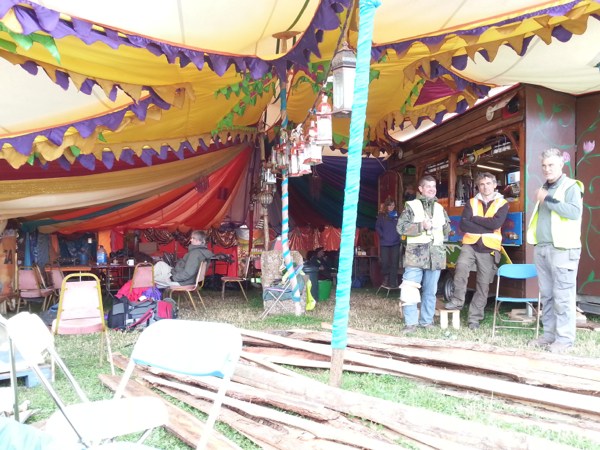 It’s an astonishing transformation that happens because of the 30,000 people involved in the staging and set up of Glastonbury. Since time immemorial humans have held festivals; spectacular occasions at which to rejoice in the delights of being alive. Festivals are about escapism and celebration and I’m definitely up for both. I think I’ve loved parties (or at least the idea of them!) ever since my 6th or 7th birthday which was crowned with a 3D polystyrene fairy castle with lights in the turrets, built for me by my Dad. 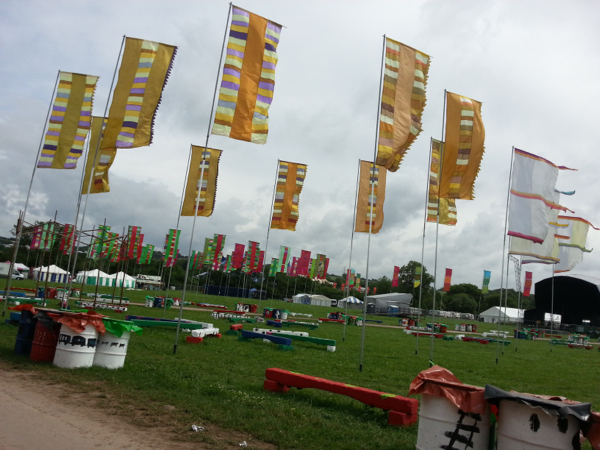 And now I can’t wait to go to Glastonbury with all its spires and magical kingdoms. I haven’t been since having the girls 12 years ago. 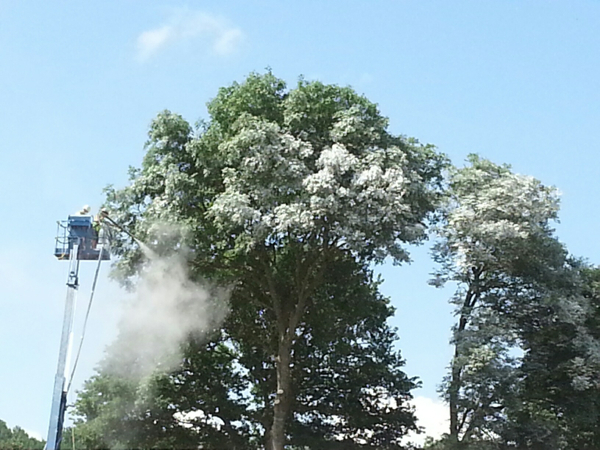 More recently we’ve diverted our festival attention to family-focussed, smaller festivals like Green Man, Latitude, Truck and the tiniest and bestest of all: Wood Festival – yay! But now the girls are getting a bit older and we can leave them on their own with tins of beans we’ve begun to sneak off for occasional grown-up festival moments. 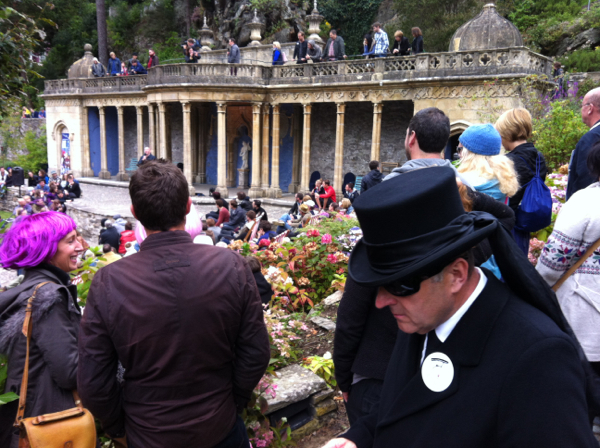 Last September we went to Portmeirion for Festival No. 6. which was absolutely fab, bar camping on a hill which I really don’t recommend. 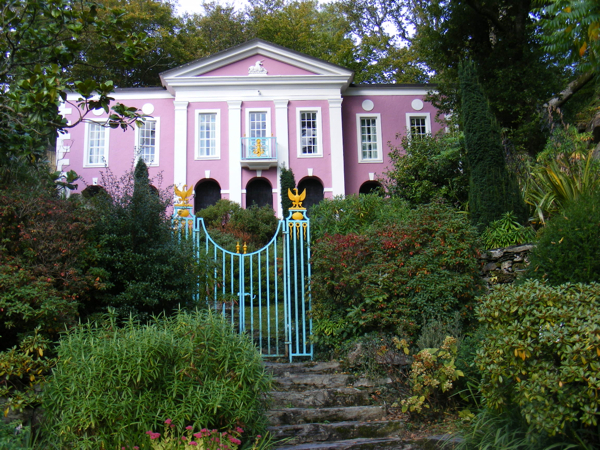 Portmeirion is very special to me, having spent many childhood Summer holidays in nearby Portmadog. We’d make an annual pilgrimage to Portmeirion village via the ‘train bach‘ and a secret over-the-fence back entrance that has long since been closed up. Walks in the woods, on the beach and in, out and around the wonderful architecture of Sir Clough Williams-Ellis. All this first fuelled my love of quirkiness in all its glorious forms. If you haven’t been to Portmeirion please put it on your list of essential places to visit. It is spectacular and wondrous. If you don’t believe me, then follow all the hollywood stars, famous authors, top musicians and King Zog of Albania, all of whom have stayed here since the 1920s. Just like Portmeirion, the thing I am most looking forward to at Glastonbury is the crazy architecture and the make-believe worlds which here will only exist for a few short, heady days. I hear tales of Block 9 with derelict buildings, abandoned New York cabs and a tube train, jostling for attention with the Unfairground – another dystopia built with plywood, paint and heaps of creativity. Strange landscapes looming out of the countryside, that will only come alive at night once the live music finally subsides. I can’t wait. I think perhaps I would’ve, could’ve, should’ve done something in this kind of world, had life taken different turns. But I’m very happy to enjoy the magic rather than create it. 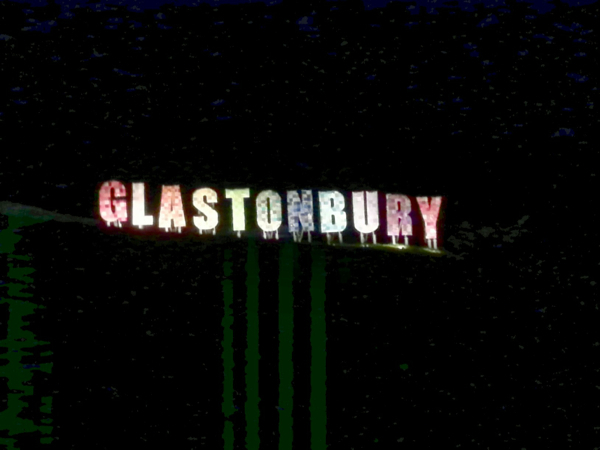 Glastonbury in lights. Quilted lights of course. And there are a few favourite haunts of old to revisit. 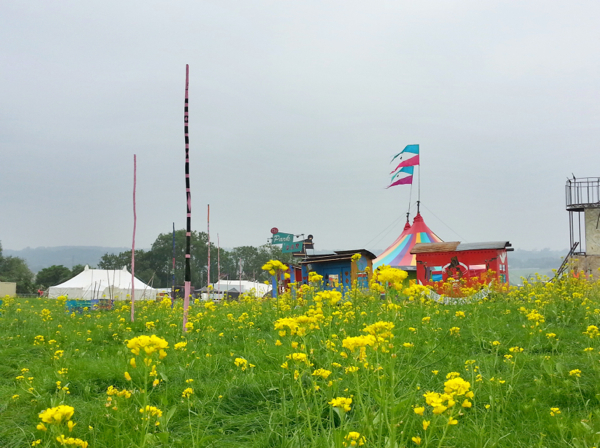 The Tiny Tea tent in the Green Fields will be a daily destination for, err, tea. And now that I don’t drink alcohol it might be my bar of choice rather than the cider bus. This Glastonbury will doubtless be a very different experience for me because of the absence of booze, though none the worse I’m quite sure. I daresay some things will stay the same – like the mud and the toilets however I don’t think the grass will talk to me this time. And if the toilets are all too much without the numbing effects of drink then I’m in the luxurious position of being able to retreat to staff quarters. 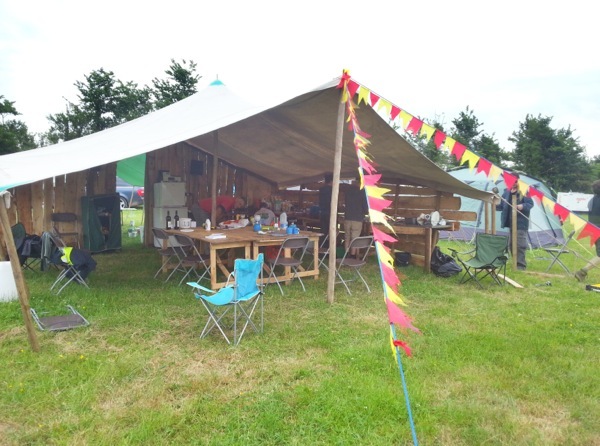 Danny and co. are working (hard I might say, 12 hour days mostly) for Avalon who provide many of the bars and the hospitality, so we camp in their staff enclosure complete with showers and toilets, which based on past experience will mostly work and mostly contain toilet roll. What more could a girl want. Not much actually; I’m quite happy to slum it and I definitely don’t need a hairdryer or an iron. It’s not a wedding is it? 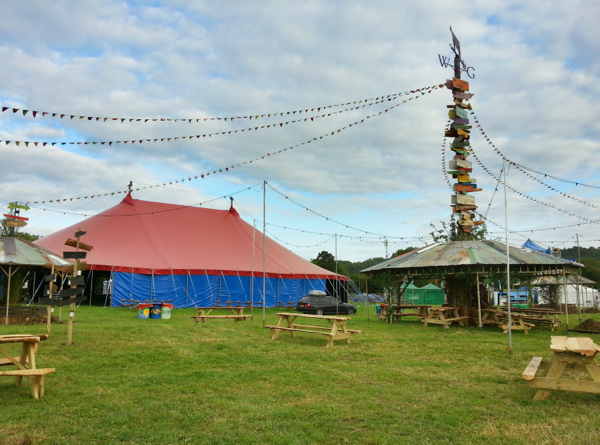 Being builders and seasoned Glastonbury workers, Danny’s gang have honed the art of a top-notch camp that is the envy of other crews on site. A well-equipped kitchen with fridge-freezer, stereo system and communal dining table all await. Torquay Mark is camp chef, turning out risotto, cheesecake and not a burnt sausage in sight. This year they’ve thankfully rejected the widescreen tv that invaded their camp for one year only! I kid you not: last year one of their number was found watching the bands on telly rather than going to see them play live in the next field. Oh so wrong! Slightly bizarrely perhaps, the music is a bit of a mystery to me. I’ve never chosen a particular festival because x, y, or z band are playing, though of course I won’t go to a festival that favours music I don’t like. But I go for the event itself, for the joy of it, to spend time with friends, play with the kids and see some great music at the same time. It is also true that as I ahem, mature, I have less and less idea who any of the bands are anyway. My first look at the line up for Glastonbury and I was a bit lost after the Rolling Stones and a handful of others. So it’s lucky that I like a surprise. All I seek is my ‘festival highlight’ – it’s a quest, a mission of mine to experience at least one special moment and I haven’t yet been to a festival that has failed to deliver. We always find great musical moments though often not by the bands we expected greatness from. Gotan Project, Tunng, Gruff Rhys (thank you very much), John Grant, New Order, Future Islands – these have all been surprise highlights from past festivals. I have high hopes that this expedition to Glastonbury will be no different and I can’t wait to experience it all through new, clear eyes. Mind you, with the organisation and planning that’s involved in getting me out of the house, my eyes will still be bleary, just for different reasons. Honestly, will all you parents who are reading this please take a moment to congratulate yourselves for all that you do in the name of parenting. Writing detailed notes regarding the girls commitments for just a few days is like writing military manouvers and it makes me realise exactly how much is involved in this parenting game. So really, well done to all of us. Three cheers! 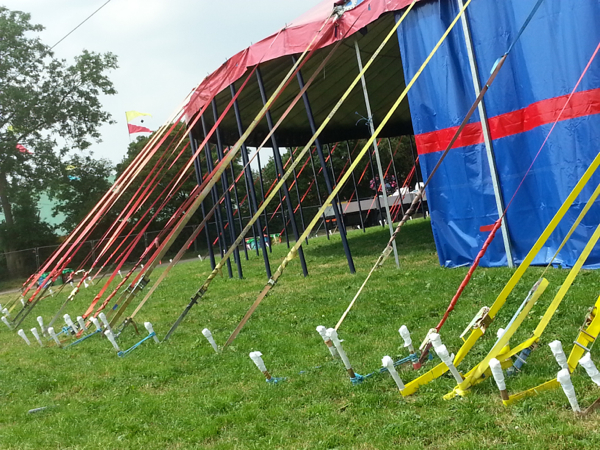 What’s a festival without flags? 2. Take clothes for cold weather. Unless it’s a scorcher the evenings will still get cold. 3. Don’t try and fold your sleeping bag neatly – stuff it in the bag. It’s the best way and it’s very satisfying when we spend most of our lives trying to create order from chaos! 4. Boys; please don’t wee up the perimeter fences. Someone has to dismantle them afterwards. 5. Take an edible treat or two. A couple of bars of lovely chocolate can brighten the dullest day. 6. Snuggle up close with your valuables. 7. 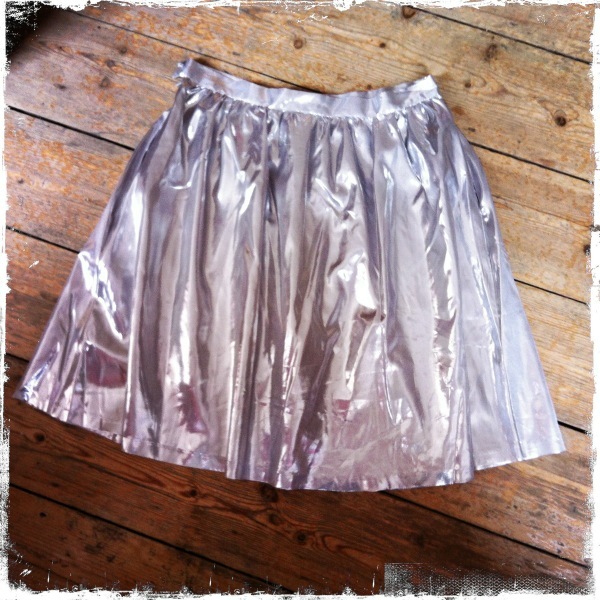 Pack your festival skirt. And wear it. Whatever the weather. Told you I needed it. This entry was posted on June 26, 2013 at 12:42 pm and is filed under Musings, Treats & Celebrations. You can follow any responses to this entry through the RSS 2.0 feed. You can leave a response, or trackback from your own site. Ahhh very jealous! I bet it was fantastic and for once the weather was great. Lucky you. Highlights please? It was amazing and yes the weather took it to a different level. And thanks Sara, you’ve prompted me to stop slacking and write up some highlights. Watch this space!